This scene is a fantasy set at the court of the emperor of China in a legendary time. 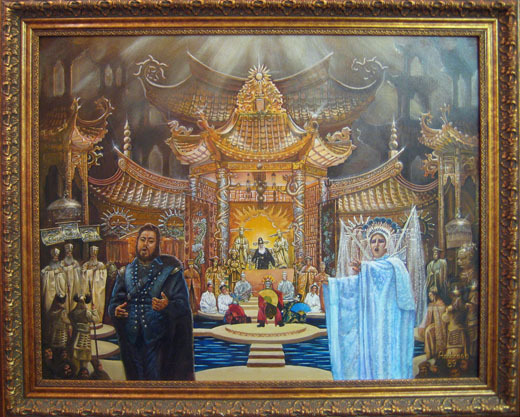 The set as portrayed in this painting is modified and abbreviated, leaving out repetitive elements of Zeffirelli’s design. Furthermore, Pavarotti never sang in this Metropolitan Opera production, but I put him into the costume of the lead tenor vocalist playing the part of Calaf. Dimitrova, on the other hand, was definitely cast in this role in the title role of Turandot. The painting was executed in 1989 as a gift to my late brother David, the world’s greatest authority on lyric opera that ever lived. Since 2003, it has passed to the hands of his widow, Anna Maria.